Whether you are looking for small and intimate or lavish and extravagant, we have everything you need to make your special occasion truly unforgettable! The Durban ICC Complex is chosen by a growing number of discerning clients who are looking for the top-class facilities, excellent service, and sheer glitz and glamour that only Africa’s leading conference centre can provide. Fine dining and impeccable service are guaranteed. Our world class chefs will assist you with your culinary selection and our dedicated team of professional co-ordinators will ensure that your day runs smoothly, down to the very last detail. We cater for functions from 100 guests upward to 4,000, with a wide range of decor options, a grand foyer and parking for 1,000 cars. We will help you choose your menus and if you are looking for a themed function, we will work with specialists in this area to make your dream event come to life. For just one moment in time, you are not going to be someone’s daughter, sister, friend or fiancé – you are going to be the Bride! We are here to help you plan the perfect wedding and help make it the most memorable day of your life. The Durban ICC complex offers a range of venues to choose from, including our ever-popular Coast of Dreams and the breath-taking Hall of Stars that offer a romantic backdrop to your special occasion. For occasions for 300 guests or more, we offer a Private Events Package which offers excellent value-for-money and includes the venue hire, a range of menu options, beautifully laid tables and a red carpet entrance. These ever-popular buffet selections offer a variety of tantalizing taste sensations that will guarantee you and your guests a truly memorable experience. For smaller, more intimate private events, you may prefer to choose one of our highly creative and delicious lunch or dinner Selector Menus. These menus are perfect for 100 – 299 guests can be served Buffet-Style or plated for your guests. Talk about being spoilt for choice! Bar facilities are arranged according to your requirements, with all beverages being billed on consumption. With support from our specialist technical team, your co-ordinator will assist you in creating the ambience you dream of. 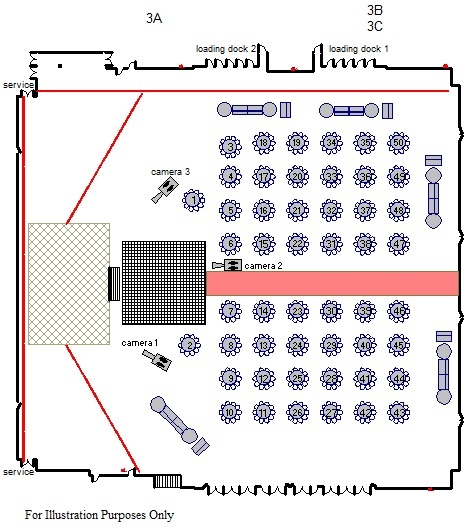 Speak to her about optional extras such as theme decor and special lighting effects. She will also be happy to assist you with contact details for approved decor, floral and entertainment specialists. Please feel free to contact us so that we can share all the wonderful possibilities with you. Please note that owing to business demands, bookings for Private Events may only be confirmed 6 months prior to the chosen date. One particularly creative couple made excellent use of the venue’s versatility for their special day. The wedding ceremony was held in the Hall of Stars with guests seated in the raked auditorium seating, before moving through to Hall 2 for pre-reception drinks and snacks, complete with live cooking stations. Finally the guests made their way to Hall 3 for their main reception banquet. A truly special day for everyone!